The youngest surviving child of the ‘Catholic Kings’ of Spain, Katharine was born on 16 December 1485, the same year that Henry VII established the Tudor dynasty. At the age of three, she was betrothed to his infant son, Prince Arthur. In 1501, shortly before her sixteenth birthday, Katharine sailed to England. But her marriage to Arthur lasted less than six months and was supposedly never consummated. Katharine was then betrothed to Arthur’s younger brother, Prince Henry. When he became king in 1509, at the age of eighteen, he promptly married Katharine and they lived together happily for many years. But their marriage produced just one living child, a daughter called Mary, and Henry was desperate for a male heir. He also fell deeply in love with another woman. Cast aside, Katharine fought against great odds to deny Henry an annulment. But the king would not be denied and when the Catholic church would not grant the annulment, he declared himself head of a new English church. Katharine was banished from court and died on 7 January 1536, broken-hearted but still defiant. 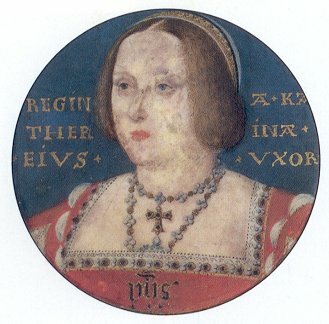 Katharine was born on 16 December 1485 at Alcala de Henares, in the archbishop of Toledo’s palace. Her early life promised a future of splendor and success, if not personal happiness. Her parents, Ferdinand of Aragon and Isabella of Castile, were legends throughout Europe. Their marriage had united the kingdom of Spain and together they had driven the Moors from Granada. Katharine’s mother was deeply pious and very intelligent. Her children, even the daughters, received excellent educations. Katharine’s brother Juan and sister Joanna were married off into the powerful Hapsburg family and two other sisters, Isabella and Maria, would each marry the king of Portugal. Katharine was promised to England; the betrothal contract was finalized before her fourth birthday. The island nation, so long torn between Plantagenet cousins vying for the throne, was now ruled by Henry Tudor. He had married the daughter of the former Plantagenet king, Edward IV, and in 1486 had a male heir and a desire to establish the stability and validity of his new dynasty. A match with a Spanish princess would give him both. And so Katharine, proud and solemn and accompanied by a vast dowry, came to England in 1501. She wed Prince Arthur within a few weeks of her arrival. It was a grand celebration; all of London rejoiced and there was every expectation of a glorious future for both husband and wife. They left for Ludlow Castle, the government seat of the Prince of Wales, and within six months Arthur was dead. It was the dreaded sweating sickness. The news devastated his parents. Katharine returned to London but was not sent home. Henry VII was already writing to her parents about another marriage. Katharine was now promised to Arthur’s younger brother, Henry. Born 28 June 1491, he was almost six years younger than Katharine. But he was robust and healthy, and already regarded as a precocious intellect. Before his brother’s death, he had been destined for the church and educated accordingly. But now he was the future king and as such he needed a future wife. Henry VII betrothed young Henry to his brother’s widow, a plan which required a papal dispensation. Ferdinand, at odds with France, was anxious to please his English ally; Isabella’s piety may have ruined the plan but she was dying and did not protest. Katharine and her duenna, Dona Elvira, both wrote that her marriage to Arthur had never been consummated. Pope Julius II granted the dispensation. The new betrothal may have been spurred by Henry VII’s legendary avarice. Katharine had brought half of her dowry with her upon marriage to Arthur; if she returned home, her marriage contract required that the dowry be returned. Also, her inheritance as dowager Princess of Wales was substantial. If she left England, so would that steady income. Katharine herself wrote to her father that she had no wish to remain in England but she would obey his decision. Perhaps she had already learned enough of Henry VII’s character to know she would be shabbily treated. Despite her royal position, she lived in poverty. The Spanish ambassador was forced to buy her necessities and she was unable to pay her attendants. And soon enough Henry VII was implying that he would break the Spanish betrothal. Katharine spent the next seven years in a state of political limbo. And when he turned fourteen, Henry VII had his son publicly repudiate the betrothal, claiming that the marriage contract was made without his knowledge or consent. Yet Katharine remained in England. In 1509, the situation was resolved with startling speed. Henry VII died and his eighteen year old son became king. Handsome, proud, and imbued with the romantic spirit of chivalry, he promptly married Katharine. Did he marry her out of a sense of obligation? Was it because, as he later claimed, he wished to respect his father’s last wish? Were political councilors encouraging the Spanish alliance? Or did he love the dignified and lovely young princess? It is impossible to know. But they certainly acted like a loving and affectionate couple, far beyond typical royal marriages. There were public displays of affection, declarations of love and respect, and for a long while she was also a close political adviser. Henry VIII’s court was full of gaiety and celebration. It was a welcome change from the austerity of his father’s rule. Katharine proved herself to be the perfect consort, even when politics led her father to humiliate and betray Henry. Katharine recognized that she must choose between unwavering support of her father and loyalty to her husband. She chose Henry, though his Lord Chancellor, Cardinal Wolsey, never trusted her and instead favored an Anglo-French alliance. His influence, and Henry’s own suspicions, led the king to disregard her political advice. Katharine’s primary duty was both personal and political – to bear children, as many as possible and preferably sons. This was especially important in England since Henry VIII was the sole surviving son of his father. Katharine was far from barren and did her best; in the first nine years of their marriage, she conceived at least six times. She miscarried twice, once delivered a stillborn daughter, and two sons died within weeks. The only surviving child was a daughter, Princess Mary, born in 1516. Katharine’s last recorded pregnancy was in 1518, when she was thirty-three years old. Henry was not unhappy with the birth of Mary; he assured ambassadors that if it were a daughter this time, a son would surely follow. But it was soon clear there would be no sons. The age difference between he and Katharine was now more noticeable. The queen, struggling with frequent pregnancies and constant stress, looked older than her years. Henry was a far more prudent king than most; he had just two serious affairs during his marriage to Katharine. But one of his mistresses, Elizabeth Blount, bore him a son. It was clear he could have sons, but the queen could not. By 1527, the question of the succession was the most pressing issue facing the king. Two years before, he had titled his illegitimate son the duke of Richmond and granted him vast estates. Many, Katharine included, believed this was a preliminary step to naming him heir to the throne. This never occurred and Richmond would die in 1536, but – until then – it was a possibility. Henry sent Princess Mary to Ludlow Castle as Princess of Wales and his official heir, but even that did not stop the rumors or her mother’s concerns. Katharine confronted Henry; he responded angrily and dismissed several of her beloved Spanish attendants. Of course, they were not childless but a daughter was not the heir he needed. 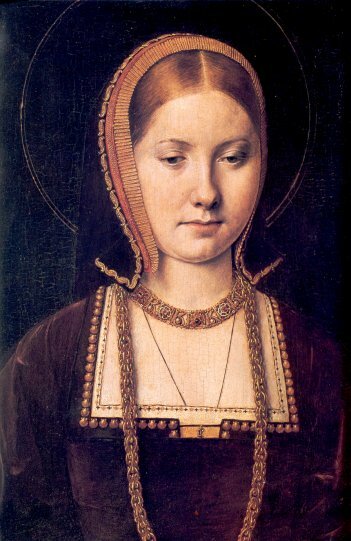 No woman had attempted to rule England since the disastrous Matilda centuriesminiature portrait of Katharine of Aragon by Lucas Horenbout before. Henry now firmly believed that his incestuous marriage had been doomed from the start. But how could he annul the marriage? He needed to convince the current pope, Clement VII, that the dispensation of his predecessor was inadequate. It directly contradicted the Bible and had no merit. This should have been a simple enough matter. Royal marriages had been annulled for far less. But Katharine’s nephew, Charles V, was the Holy Roman Emperor and he had no intention of allowing his aunt to be cast off. This was not out of personal love or loyalty, but a purely political stance. And after the 1527 ‘sack of Rome’, Charles controlled the pope. Henry was soon thwarted, despite extensive work by Wolsey and other advisers. For her part, Katharine was kept in the dark for as long as the king could manage it. But she was no fool. She knew of the romance between her husband and Mistress Boleyn; she knew Henry avoided her company, though he was scrupulous about attending official functions with her. He had always respected her unassailable dignity and eloquence. He did not wish to fight Katharine; he wanted an amicable end to their union and he was prepared to be generous. When news of his intentions became official, she was given counsel but only that chosen by the king. She turned to the Spanish ambassador and close friends at court for support. Anne Boleyn was not popular and Katharine was a respected and beloved queen. The king soon came under popular scorn for his plans. But Henry was as firmly convinced of the righteousness of his cause as Katharine was of hers. He had read the Bible; he had debated the issue with prominent theologians; he even sponsored hearings of the case at European universities. Both king and pope knew there was a valid basis for the annulment, and a pressing national need for it. Clement could have granted it without troubling his conscience. And with the spread of Lutheranism in the German states, Clement had no wish to antagonize the loyal and devoted king of England. But the English king could not be helped at the Holy Roman Emperor’s expense. This was soon made abundantly clear. The pope prevaricated; he could do little else. And for several years, the ‘King’s Great Matter’ consumed England and fascinated Europe. Henry inevitably tired of the endless parade of papal legates and repetitious hearings. He was growing older and Anne was growing impatient. Her youth was being wasted to no purpose, she told the king. Meanwhile, Katharine encouraged Mary to be obstinate in protecting her rights as princess. Mary lost her father’s favor and was forbidden to visit her mother. Finally, in 1533, Henry did the only thing he could to end the marriage – he rejected the authority of the Holy See and declared himself Supreme Head of a new Church of England. His archbishop of Canterbury, Thomas Cranmer, issued the long-awaited decree of nullity. Katharine was no longer queen of England but ‘Princess dowager of Wales’. Princess Mary was now illegitimate, and rumors spread that Anne Boleyn had finally succumbed to the king and was pregnant. Katharine was exiled from court and to a succession of damp and unpleasant castles. She had but a handful of servants for few would call her queen and she refused to be called princess. It was a mark of her early education that she was meek, deeply pious and believed in obedience to her husband – but she was also a proud and intelligent princess of Spain. She would never allow her dignity, or that of her daughter, to be destroyed. In the end, this stubborn spirit did both her and Mary far more harm than good. Katharine was undoubtedly truthful when she declared her marriage to Arthur unconsummated but the truth was cold comfort in the last years of her life. Her final years were lonely and sad; the Spanish ambassador kept her informed of outside events and smuggled letters to her daughter, but she was often ill and at prayer. The wrongs she had suffered from Henry filled her with sadness rather than anger. Perhaps she was inspired by her motto, Humble and Loyal, for that is how she remained. She died at Kimbolton Castle on 7 January 1536, three weeks after her fiftieth birthday. There were rumors that she had been poisoned. But if Henry had been so inclined, he would have attempted it years before and spared himself much trouble. A lingering illness and the psychological effects of her exile were the obvious causes. She was buried at Peterborough Abbey with all the ceremony befitting the widow of the prince of Wales. Henry did not attend the funeral; we do not know if he read Katharine’s last letter to him. It was a love letter and she signed it ‘Katherine the Queen’. The tragedy of their annulment was that both he and Katharine were equally convinced of their causes. For the modern reader, both arguments are persuasive. It is an ironic footnote to her life story that Katharine, such a devoted and pious Catholic, unintentionally brought the Reformation to England.